This is a pretty advanced piece of technology, similar to what you might see in a professional dermatologist’s office, but this is very affordable and you can use at home. The makes of the Silk’n Face FX claim that when used 3 times a week for the first month, you will see a noticeable reduction in wrinkles and facial lines, an increase in collagen production and a brighter, clearer complexion. This revolutionary technology provides immediate and long term skin rejuvenation and has been clinically tested and proven to work. It is perfect for reducing forehead lines, lines under eyes, premature wrinkles and fine lines on the face. A natural way to get rid of wrinkles at home. Reduces lines under eyes, facial lines and forehead wrinkles. Brightens skin color and gives your complexion a healthy glow. Reduces the size of your pores, giving you a cleaner, healthier complexion. Can be used on face, around the eyes, and on the neck and hands. How does the Silk’n Face FX work? The Face FX uses a mix of dermal heat and red light energy to penetrate your skin and stimulate the production of collagen. The result is that both fine the fine lines on your face and your deeper wrinkles are reduced, giving your complexion a younger, fresher appearance. The combination of dermal heat and red light energy is called Home Fractional (HF) technology, which is specifically designed to target the top layer of your skin, resulting in long term improvements in the texture and appearance of your skin. Dermal heat: The Face FX heats your skin to 40-41 degrees C and in the process stimulates the production of collagen. There is a built-in temperature sensor that monitors the heat energy and automatically shuts the Face FX off if the temperature rises above 41 degrees C.
Red light energy: Red light energy promotes increased blood circulation and the growth of new, fresh cells. The red light is delivered using high power LED (light emitting diodes) which has been proven to reverse the signs of aging due to exposure to the sun. This means th at your skin texture is improved, pore size is reduced, skin tone is improved and fine lines and wrinkles are minimized. 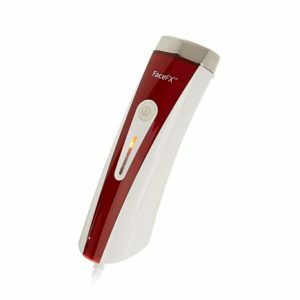 So the Silk’n Face FX is a hand held device that emits red light energy and uses heat to get rid of wrinkles under eyes, minimize fine lines and premature wrinkles due to over exposure to the sun, and increases the production of collagen to give your skin a softer, more radiant appearance. How do you use the Silk’n Face FX? It is recommended that you massage each area of your face, neck or hands for 3 to 5 minutes, 3 times a week for the first month to achieve the best results. After this, you can reduce your use to once a week and you should see noticeable results in around 3 to 7 weeks. The longer you use this device, the better the results, so it is an investment in both time and money, but it is definitely worth it in the end. It is also worth your while to use a hyaluronic acid serum, which will keep your skin super hydrated and will also help to increase the production of collagen in your skin. What do customers think about the Silk’n Face FX? Online reviews for the Face FX are very favorable with the vast majority of customers recommending this product as a way to prevent premature wrinkles and fine lines. Short –term, there’s a little bit of redness, it goes away very fast. It works. And for the price you would pay to go to a professional, you can keep using this over and over and over. I keep using it. I like how it has a brightening effect for me. It buzzes, but it doesn’t zap your skin, I thought it was going to hurt, but it doesn’t. FX smooths your skin, you feel like your skin is nice and plump and smooth. I really noticed a difference on the area above my lips – I was about to get a filler and now I don’t need to. This is a great way to prevent premature wrinkles caused by the sun and an easy way to plump up your collagen and reduce age spots and sun spots, giving your skin a healthier, fresher look. It is also at a good price point, so it is very affordable for most people and a good option to face lifts and other expensive treatments. If you want an at home treatment to prevent wrinkles and are wondering how to get rid of forehead wrinkles, fine lines and wrinkled skin on your neck and hands, then the Silk’n Face FX might just be the solution you have been looking for!